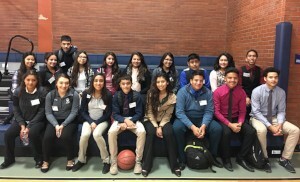 Arrupe Jesuit High School offers 8th graders the opportunity to spend a day on campus to experience what it's like to be an Arrupe student. 8th graders are paired up with current Arrupe students on their shadow day. Our shadowing season for the 2018-2019 school year will run September 18th through November 15th. Shadow Students should report to the front lobby at 7:45am. They will attend a full day of classes and lunch will be provided. Shadow dismissal is at 2:00pm and all students will be dismissed from the front lobby. Business professional or middle school uniform. Young Ladies: A button up blouse with sleeves, dress pants (or knee length skirt) and dress shoes. Young Men: A long sleeve dress shirt, tie or bow tie, dress pants, dress belt and shoes. Contact the Admissions Office at 303-455-4661 if you have any questions.